Fresh Veg, Salad, Veg Boxes and Mixed Fruit and Veg Boxes! You may choose from our selection of set price boxes comprised of a set number of organically grown seasonal UK grown vegetables. The contents will vary weekly as much as is seasonally possible but we will always aim to include some staples such as potatoes, carrots and onions although we cannot guarantee to include all 3 every week. Please inform us in the special instructions section of the checkout form if you have any allergies or do not like a particular veg. Have a look at the link "What's in my box this week?" on the left for an idea of what you can expect to find in each box. This page is updated every Monday evening, so check back then to see what is coming in your box that week. The box scheme works around the principles that you don't necessarily know what's coming in your box when you order it by a Sunday evening. Please let Laura know by Tuesday lunch time if there is something in your box you do not like so this can be substituted. The best way to avoid receiving veg in your box you don't like is to include a list of the veg you don't like in the special instructions box of the checkout form. Within reason, we are happy to substitute items if possible. The descriptions below are a guide only and the box contents will depend upon product quality and availability, if you have any special requirements or would like to discuss which box may best suit you, please don't hesitate to contact us through the contact form on the left hand side or give Laura a call on 07462909238. Please note, the quantities described below may vary depending upon the time of year and the availability of produce. 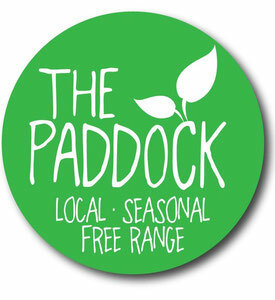 The Paddock has worked hard to create a network of local producers with whom we work, and as such availability can vary weekly. All of our fruit and veg is always grown organically, we aim to source as locally as possible and at certain times of the year, such as the Summer months there will be an increased amount of produce available locally. The following boxes are perfect for those who want to eat locally grown, organic veg, always in season. Small Veg Box £12 - 8 seasonal varieties of organically grown veg (some in smaller portions than the medium box) but still with variety e.g. more greens, less roots and some salad when in season, whilst still including approx 600g potatoes (this may be less if new potatoes), 3/4 carrots and 3/4 onions. Suitable for 1 -3 people. If you live alone, this option may suit you once every 2 weeks depending upon how much veg you eat! Medium Veg Box £15 - 10 seasonal varieties of organically grown veg (some in larger portions than the small box) but focusing on variety rather than large quantities - including a large bag of mixed size potatoes, a large bag of carrots and a large bag of onions, suitable for 2 - 4 people. A good balance of roots and greens, with sometimes the odd salad item in there too when in season! Large veg Box £24 - 11 seasonal varieties of organically grown veg (in larger portions than the other boxes) including 1.5-2kg mixed size potatoes, approx 1.5kg carrots, and a large bag of onions, suitable for 4 or more people. A good balance of roots and greens, with sometimes the odd salad item in there too when in season! Basics Box £16 - 7 varieties of seasonal, organically grown veg based around the staples, with larger quantities of the most popular items than the medium box, including approx 2kg carrots, 2 kg mixed sized potatoes, a large bag of onions and larger quantities of other items such as root veg and leeks as well as some greens such as cabbage and broccoli, suitable for 2 - 4 people. A good option for families who would like a similar box to the medium but with less variety, providing a good selection of veg for the Sunday Dinner! Salad Bag £12.50 - 6 varieties of organically grown salad, seasonal when UK produce is available but at sometimes during the year, the produce may be imported, suitable for 1 - 2 people. Soup Bag £12.50 - Between 6 - 8 varieties of organically grown, seasonal soup making veg for those colder months designed for those big pans of soup! Suitable for 1 - 2 people. This box will include veg such as leeks, carrots, onions, potatoes, turnip, swede, squash, parsnips etc. Made up mostly of root veg, this box will not include greens such as cabbage, cauliflower or broccoli and will not necessarily include potatoes, carrots and onions every week like some of the other boxes. 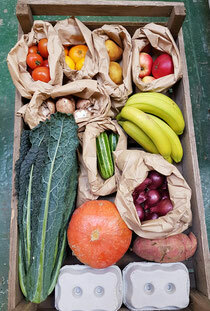 Mini Mixed Fruit and Veg Bag £12.50 - 7 varieties of organically grown fruit, salad and veg, with a maximum of 2 varieties of fruit. This box will not necessarily include potatoes, carrots and onions every week, but will comprise of seasonal veg and salad alongside UK grown fruit when available, or imported fruit at other times of the year. Suitable for 1 -3 people. Mixed Fruit and Veg Box £17.50 - 10 varieties of organically grown fruit, salad and veg including approx a large bag of potatoes, carrots and onions when included. This box will not necessarily include potatoes, carrots and onions every week. Choose to have up to 4 varieties of fruit (not necessarily UK grown) and the remainder of the box made up with a selection of seasonal vegetables and/or salad items up to a total of 10 varieties. Please state in the special instructions box of the checkout form how many varieties of fruit you would like in your box (up to a maximum of 4) otherwise we will include between 2 and 4 varieties depending upon what is available that week. .Suitable for 2 - 4 people. Large Mixed Fruit and Veg Box £25 - 14 varieties of organically grown fruit, salad and veg including approx a large bag of potatoes, carrots and onions when included. This box will not necessarily include potatoes, carrots and onions every week. Choose to have up to 6 varieties of fruit (not necessarily UK grown) and the remainder of the box made up with a selection of seasonal vegetables and/or salad items up to a total of 14 varieties. Please state in the special instructions box of the checkout form how many varieties of fruit you would like in your box (up to a maximum of 6) otherwise we will include between 3 and 6 varieties depending upon what is available that week. .Suitable for 4 or more people. The following boxes are perfect for those looking for less roots in their box. Whilst they maintain a seasonal element, some of the fruit and veg may be imported, but will always be organic. The Super-food Detox Box £19 - Packed with a selection of 9 varieties of mostly seasonal, organically grown fruit and veg considered to be a super-food! A super-food is defined as a nutrient rich food considered to be especially beneficial for health and well being. The fruit and veg in this box are crammed full of vitamins, minerals and powerful antioxidants such as calcium, iron, fibre, folate, potassium, magnesium and more. Bake, steam, stir fry, boil, eat raw, juice, smoothie or spiralize - whatever your preference you can be sure the selection in this box will give you that all important immune boosting dose of the good stuff! We will focus on UK seasonal veg as always but you can expect to find non UK produce in this box such as bananas, avocados, turmeric, garlic, ginger, sweet potatoes, grapefruit, kiwi fruit etc when available. Other fruit and veg you can expect to find in this box include; beetroot, kale, carrots, tomatoes, broccoli, purple sprouting broccoli, mushrooms, spinach and apples. This box will not be focusing on providing the staples such as potatoes and onions as most of the other boxes do. Less Roots. Suitable for 2 - 4 people. Mediterranean Box £18 - 7 varieties of organically grown Mediterranean style veg in larger quantities than other boxes, not necessarily UK grown, although during the Summer months, the majority of this box will be locally grown. A good option for pasta or roast veg. This box includes veg you are not likely to find in any of the other boxes year round such as sweet potato, butternut squash, courgettes, red onions, peppers, mushrooms and tomatoes! Less Roots. Suitable for 2 - 4 people. The Sunshine Garden Box £20 - Inspired by my garden allotment, and the feeling you get when the sun shines through the trees on a lovely Summer's day and you look at all of the beautiful produce you are growing. If only we could capture that feeling year round. This box comprises of 10 varieties of organically grown veg, 5 of which are Mediterranean style (some in smaller quantities than the Mediterranean box) and not necessarily UK grown all year round such as tomatoes, courgettes and sweet potatoes alongside 5 varieties of UK grown, local, seasonal veg such as leafy greens. This box may include potatoes, carrots and onions occasionally but will not include the staples every week. This is a great option if you like to combine courgettes, tomatoes and sweet potatoes with some lovely local greens such as kale, purple sprouting broccoli and salad and is a perfect option for those wanting to eat more seasonally but a bit sick of the Winter roots or not quite ready to give up on the taste of Summer. A perfect marriage between the Sunshine of the Mediterranean, and lovely hot Summer days spent on the local allotment and a great option for pasta dishes, risottos or roast veg. Less Roots. Suitable for 2 - 4 people. Small Sunshine Garden Box £14 - A Little Ray of Sunshine 6 varieties of Mediterranean veg (not necessarily UK grown), and locally grown, seasonal greens (approx 3 of each) in smaller portions than the larger box. Perfect if you like the variety of the larger box, and the Mediterranean veg, but would still like a seasonal element to your box and don't require as much veg as the larger box offers. Less Roots. Suitable for 1 - 3 people. Alternatively, you can make up your own box from the list of organically grown individually priced veg or use this option to add extra items to your box. Please select your veg from the drop down menu and add it to your cart, once you have added it to your cart, you can update your cart to change the quantity. If you have a special request for a certain veg that is not on the list, please contact us via email and we will do our best to accommodate you. All of the veg on this list is subject to availability.